1 Zippy 11.1 V 2200 mAh. 1	Bluetooth module Hc-06 or Hc-05. 4 ESC 20A (Electronic Speed Control). 4 Brushless motor 2280kv . 2 5in - 7in CW Propeller. 2 5in - 7in CCW Propeller. An Arduino is an Italian microcontroller, which is small computer in one single Hardware and Software knowing for it’s open source environment and versatility. The Arduino UNO is the most common used by the hobbyist because of it’s low price and high quality. The arduino is composed by different electronic components such as resistances, leds, pin etc. but for this project we have to notice this seven parts (Figure 1.1). (Figure 1.2: Arduino UNO) Aqua Rectangle: The jack for the USB connection, the component we will to use just for downloading the code into the Arduino. Green Rectangle: The Reset Button. As the name suggest, the reset button is a master hardware reset, when you press it the code will star from the beginning. Yellow Rectangle: Digital Inputs. This is the way our Arduino receive digital data (binary) from the sensors buttons or in this case, our motors. Grey Rectangle: The Tx/Rx pin is the main channel of communication for our bluetooth device. For each time you download the code you’ll need to unplug this two wires and then reconnect it after the download. Blue Rectangle: The Analog Input. This is the way our Arduino receive the Analog data in this case from our accelerometer. Protoboard: Board made for quick prototyping used in electronic projects such as ours. An accelerometer is a sensor made specially for measuring the propel forces, acceleration or differences in speed. Our GY-61 (Figure 2) is a 3 axis device which means that can measure the acceleration in 3 axis at the same time. Is important to distinguish each pin from each axis in order to have a correct measurement. Once we have our two wires connected is moment to connect our first component the Accelerometer. We have to remember that the order of connections in this device are really important, because you need to connect exactly the same as shown if you don’t do so, your lectures will be in a different axis. Having this view from the accelerometer in our protoboard, this are the following connections: White wire: (-) Negative, GND or Ground. Blue wire: Goes to the A0 from the Analog Inputs in the Arduino. Yellow wire: Goes to the A1 from the Analog Input in the Arduino. Green wire: Goes to the A3 from the Analog Input in the Arduino. Orange wire: (+) Positive, 5V or VCC. So at the end of the connections the Arduino should look like the Figure 6.1. Once our Accelerometer is connected, We have to connect the Bluetooth device. Remember that in the back of our module all the connections are labeled (Figure 4). That means the VCC is the 5V or (+) of our power source and GND is the negative (-). Keeping that in mind should be easy to made the connections. 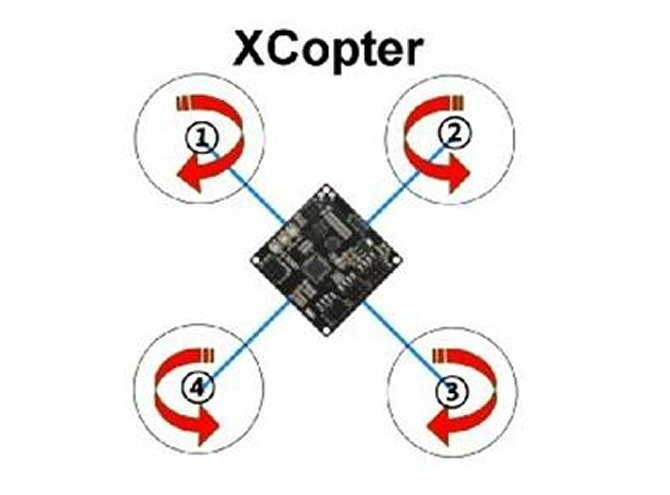 It is really important that the RX from the Bluetooth module is connected to the TX in the arduino, the TX makes reference to “Transmitter” if you connect the two TX you will have two transmitters crashing and two receivers that are not receiving anything. After all the connections the module should look like the Figure 7. (Figure 7: Bluetooth connections) With this perspective the module is connected to the arduino in this way. Grey wire: Tx in the Arduino. Yellow wire: RX in the Arduino. Red wire: VCC, 5V, (+) Black wire: GND (-) The connections should look like the one in Figure 7.1 in the Arduino. (Figure 7.1 Connections from the Bluetooth module). The last connection is divided in three phases. The first phase weld the ESC to the Brushless motor. The important aspect from this welding is the fact that we have to make two motors spin at different direction from the others two (FIgure 8). The reason is very simply, if all the motors are spinning at the same direction the moment or torque generated from all the propellers will cause the drone to spin out of control in the same direction of the motor. Changing the direction of two of them will cause an equilibrium  and the Quadcopter will stay still. Two of the connections between the ESC and the motor is shown in the figure 8.1 where the cable A from the ESC is connected to the center of the motor, the cable B is connected to the left cable of motor and the cable C is connected to the right cable in the motor. Remember to protect the welding when finished with thermofit or tape. Our connections are done by now. To summarize: Bluetooth: Vcc, TX into the RX of the arduino and Rx into the TX of the arduino and GND Accelerometer: 3 wires in the arduino, Vcc and GND ESC: All the red and black ones connected in parallel 3 wires to the motor and 3 extra wires ; one for the Vcc of the Arduino, one for the GND of the arduino and one for the signal. Once our hardware is connected we develop our software. Before we download our final code we have to calibrate our motors and ESC. The reason to calibrate is because our motors respond with a three phase signal (Figure 9.1) changing the order of the wires change the order of the phases which results in a change of the rotation. We have to notice that the behaviour of the motors will be 3 seconds in maximum velocity and 4 seconds off. That is to have the same sequence and phase in all the motors.